Do you consider small cap stocks for investment? If No, you are missing an opportunity to earn big money. Although small cap stocks are rarely on the radar of investors, these stocks can give very good returns, provided they are chosen wisely. If you take a look at ace investors like Rakesh Jhunjhunwala, Porinju Veliyath they are the big fan of small cap stocks. Rakesh Jhunjhuwala king of Dalal Street always suggests investing in small cap stock which has potential to become large cap. 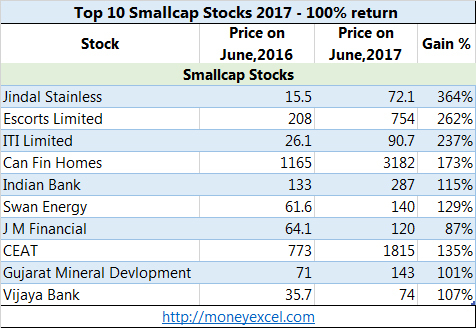 Here is a list of 10 Small cap stocks have doubled investor money in last one year. Jindal Stainless, Escorts Limited and ITI Limited is leading the chart by giving 364%, 262% and 237% return respectively. Followed by Can Fin Homes, Indian Bank, Swan Energy & CEAT by giving 173%, 115%, 129% and 135% return. In past small cap stocks has given very good performance. It is expected that small cap stocks will perform better in future. Here are small cap stocks recommended by Stock market experts. Porinju Veliyath is a veteran stock market investor. Porinju Veliyath has created a lot of wealth from the stock market. He is famous for suggesting multibagger stocks for investment. Small cap stocks suggested by Porinju is given below. TCI – Transport Corporation of India is first stock recommendation for Investment by Porinju. TCI is a leading logistic service provider of India. TCI has well integrated network of multiple logistic vehicles including trucks and ships. TCI will be one of the biggest beneficiaries of GST implementation. You can invest in TCI with long term perspective. Ginni Filaments is in the business of textile. Ginni Filaments exports its product to global consumers such as Disney and Benneton. Financial performance history of this stock is very good. Porinju Veliyath has recently purchased this stock. HSIL – Hindustan Sanitary ware limited is another stock recommendation by Porinju for investment. HSIL is in the business of sanitary ware. HSIL will get benefited from upcoming infrastructure projects. GST will also give benefit to HSIL. In addition to above, Porinju Veliyath has also recommended small companies like Saksoft, Datamatics, Bombay Burmah Trading Corporation and Orient cement. Dolly Khanna and Rajiv Khanna are most successful stock market investors of Dalal Street. This couple has an incredible ability to identify multi-bagger stocks for investment. Dolly Khanna is famous as lady with Midas touch. The small cap stock suggested by Dolly Khanna is given below. Tata Metaliks is blue chip small cap stock. Tata Metaliks is leading manufacturer and supplier of Pig Iron and ductile pipes in India. A growth in urbanization and infrastructure development will lead to increase in demand of water and waste water pipes, which will be beneficial to Tata Metaliks. Dolly Khanna has purchased lot of shares of Tata Metaliks. Vijay Kedia is well known name in stock market. Vijay Kedia has created lot of wealth from stock market.Vijay Kedia is an inspiration for many investors who are seeking success from the stock market. Here is stock suggested by Vijay Kedia. Vaibhav Global is e-commerce Diamond Company. Vaibhav Global enjoys very good business model. Financial performance of the company is improving. Vijay Kedia has done good investment in this stock. He is recommending to invest in Vaibhav Global Stock. What is your call on above Small Cap Stocks?